Last week, as I was putting together a menu plan, I decided that we needed a dish that would use up the leftovers in the refrigerator. I had two pork chops (already cooked), some steamed broccoli, and some steamed sugar snap peas. At first I thought I'd make pork fried rice, but (after I posted Menu Plan Monday) I decided to make lo mein. Now, I claim absolutely no authenticity in this recipe: I just tossed together the ingredients I had on hand, and we liked it. 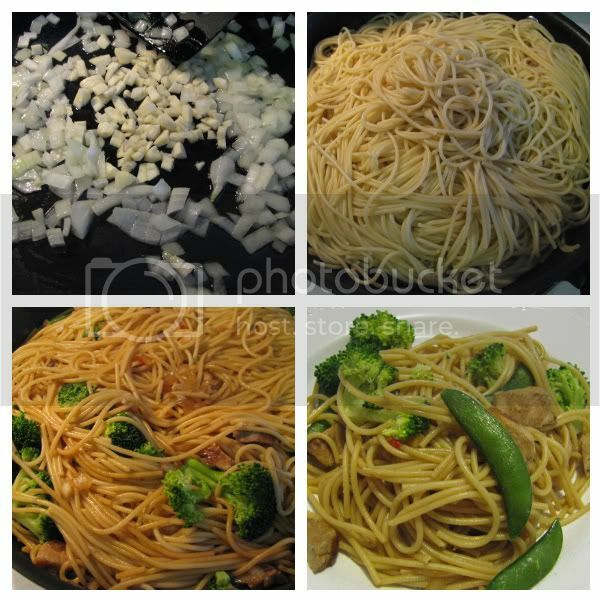 The bonus is that, since the only non-leftover main ingredient is the pasta, this dish was inexpensive to make. Cook spaghetti according to package instructions. While that's cooking, cut the pork into bite-size pieces; chop the garlic (half a bulb?) and onion (1 small/medium). Cook the garlic and onion in a small amount (2 tablespoons?) of oil in a large skillet. When the garlic and onion are soft but not browned, add the pork and the drained pasta to the skillet. Add seasonings (all quantities are estimated): sweet chili sauce (1 tablespoon), black pepper (1/2 teaspoon), sesame seed oil (2 teaspoons), soy sauce (1/4 cup), rice vinegar (1 tablespoon). Stir to combine. Let cook for 5-10 minutes, stirring occasionally, to let the flavors blend. Add the vegetables and cook just until heated through. I brought extra soy sauce and sweet chili sauce to the table; this recipe is a little light on the soy sauce because I was trying to limit the sodium content. WOW Melissa this sounds really good. I never used sweet chili sauce, I'm going to pick some up next grocery run. Your recipe for lo mein sounds GREAT!!! and with broccoli even better. OH Girl I'm loving it!! And the pictures are so great!